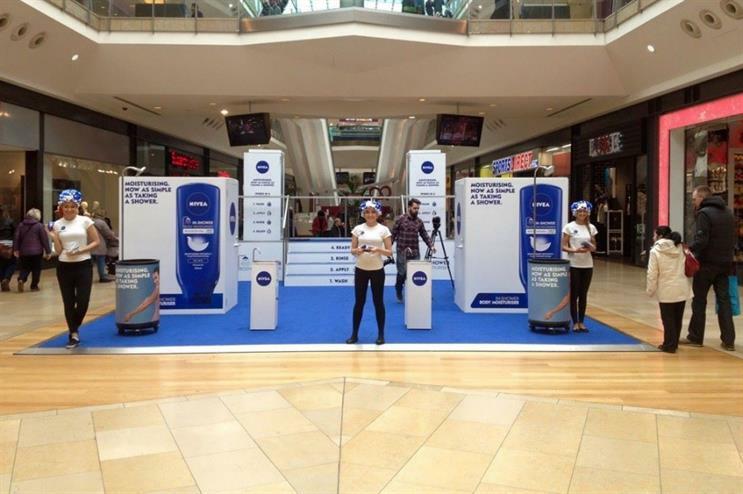 Experiential agency Space has developed a retail activation to promote Nivea's In-shower Body Moisturiser, encouraging shoppers to fully sample the product in a pop-up shower stall. The Nivea activation features fully-frosted showers, along with changing rooms that allow participants to try out the in-shower moisturiser. Brand ambassadors will be present to answer any questions and carry out demonstrations. Guests will receive a full shower kit consisting of a swimsuit, flip-flops, a shower cap, robe and towel and, when ready, will be invited to fully sample the product in the branded showers. Less gregarious consumers will be invited to hand-test the product in sinks instead. Following a competitive three-way pitch, Space was tasked with developing activity to raise awareness of the shower product and dispel confusion around its use. An estimated 100,000 50 millilitre samples of moisturiser will be handed out throughout the experiential campaign, alongside £20 shopping vouchers as a reward to those who brave the showers. The intimate brand experience will land for four days in the Bullring shopping centre in Birmingham today (12 March), before relocating to Bluewater in Kent on 17-23 March. Victoria Westwood, brand manager at Nivea, said: "The Space team has created a fun and innovative activity to educate people on the simplicity of using this game-changing product that will educate and entertain as well as stand out in the busy shopping environment. This high impact, slightly daring initiative will help the brand communicate directly and live with shoppers." David Atkinson, managing partner at Space, added: "Nivea has never been shy to demonstrate its products in the most dramatic of conditions. Asking people to have a shower in front of thousands of other shoppers is disruptive and engaging and this will capture attention and intrigue to get our message across."